The Government is being urged to bring back the plug-in hybrid grant, after the industry suffered another dire month for new car registrations. Plug-in hybrids were previously eligible for a Government grant of £2500 towards their purchase price, but this was axed in October 2018 in a bid to encourage the uptake of pure electric cars. In January 2019, registrations of pure electric vehicles were up by 110 per cent, but they continue to make up a fraction of all new cars sold with 1334 being registered in January. The number of plug-in hybrids, however, dropped by 15.6 per cent to 2268. 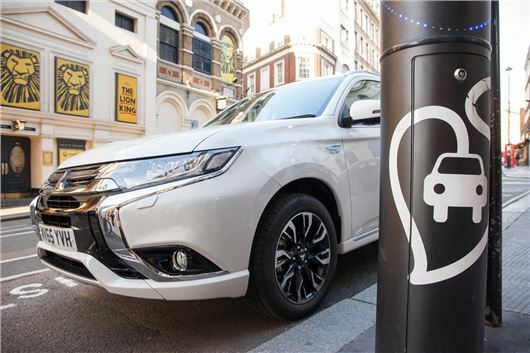 In a statement, Mitsubishi - makers of the popular plug-in hybrid Outlander PHEV - has previously said that now would be the perfect time for the Government to be incentivising such technology. "Such technology forms the perfect segue between conventional petrol and diesel powered and full electric vehicles, particularly as the charging network is nowhere near evolved enough to support widespread full EV use," said a spokesperson for Mitsubishi. "We need supportive policies to encourage buyers to invest in new, cleaner vehicles." The Society of Motor Manufacturers and Traders (SMMT), meanwhile, says that axing the grant has had a 'demonstrable impact on sales'. While the number of new plug-in hybrid vehicles being registered was steadily increasing during the first half of 2018, this trend was sharply reversed by the Government's decision to scrap the grant in October. "This is the fifth consecutive month of overall decline in the market," said the SMMT's chief executive, Mike Hawes. "To restore momentum, we need supportive policies, not least on vehicle taxation, to encourage buyers to invest in new, cleaner vehicles that best suit their driving needs – from the latest petrols and diesels to an ever growing range of exciting electrified vehicles. Petrols were by far the most popular new car purchase in January 2019 with 103,176 being sold - nearly 10 times the amount of electric and hybrid vehicles registered combined. Diesel registrations dropped to 46,823 - down by more than 20 per cent compared to the same period last year. In total, 161,013 new cars were registered in January 2019 - down 1.6 per cent compared to the same period in 2018. While hybrids are generally seen as more environmentally-friendly than equivalent petrol or diesel models, data from HonestJohn.co.uk's Real MPG database reveals that the majority of hybrids fail to meet their official fuel economy figures. Good. These companies need to let go of the internal combustion engine. Put less effort into whining about subsidies and more effort into making the outlander fully electric. The grant on full electric cars should also be scrapped. Why should people paying £30000 for a car get state help. And most electric cars cost more than this. They are whining because the government grant was going straight into their pockets when they were overcharging (no pun intended) for the vehicle in the first place. If they want to continue sales then bring the price down to what it was with the grant, simples. I am in two minds over this one I think the grant should be there for hybrid cars as the network is no where near ready to surport a wholly electric car if we needed to charge away from home and on journeys, I have never understood the £2500 grant as we are in the E.U. ( WELL FOR THE TIME BEING ) as in europe the grant is 10,000 euro's there is far more electric and hybrid cars in France than here. But I also see the thought od why should you get a grant for cars in excess of £ 30000 as most family size cars are .I could not afford to buy one and I would if the prices of cars came back to reasonable prices .I do not see that we could go fully electric for at least 10 years so hybrid is the way and I dont care what anyone says diesel is 2nd as the cars at euro 6 are cleaner and getting better and I prefer getting 52 mpg on my car tha 35 for the petrol version when we cover 17,000 a year .and the nearest plug in point is 8 miles from my house all the supermarkets and stores in my area have not got a single point to charge so how can I buy electric ??????? One of the best inventions was the internal combustion engine, and the politicians give it a bad press. This electric nonsensense is expensive, based on old technology and a gimmick. Pollution still happens at the power station to generate this energy, but I suppose out of sight is out of mind. Why has the motor industry and government gone down the electric/battery/plug in hybrid route instead of hydrogen ? Hydrogen is the way forward. Electric/hybrid vehicles are just passing the pollution back to the power stations and pure electric are just not practical for the majority of users. However, politicians are not known for forward thinking so hybrid is the best compromise PROVIDED the price comes down. Just too expensive for the majority of private buyers. If the government really wants new car sales to boom the best thing it could do would be to stop persecuting diesel. When will they get the message that these are far and away the best vehicle for high mileage users who buy most of the cars. and I charge at home overnight which does all my local journeys which are the majority. When I go on long journeys I do not charge my car on route because it takes too long for a mere 30+ miles. This is why PHEVs do not come any where near the MPG quoted by the manufacturer people will not wait 2 hours for 30 miles its easier to put in petrol 5 mins.and plenty of choice.